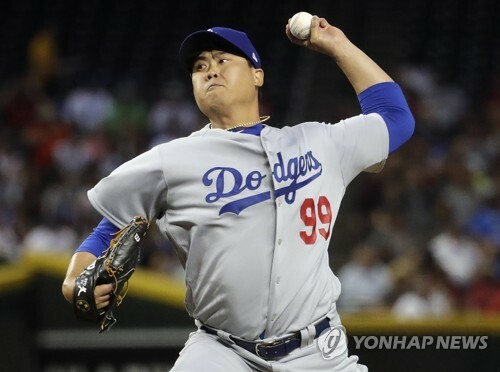 PHOENIX, April 3 (Yonhap) — Los Angeles Dodgers’ South Korean starter Ryu Hyun-jin looked shaky in his first start of the new season here on Monday, as he was unable to make an early lead stand. Ryu was charged with three earned runs on five hits and five walks in 3 2/3 innings against the Arizona Diamondbacks at Chase Field in Phoenix. Ryu left the game with the score tied at 3-3. Pedro Baez got the final out of the fourth inning, and Ryu got the no-decision, as the Diamondbacks outlasted the Dodgers 8-7 in a marathon, 15-inning affair that ended nearly half past midnight. The Dodgers staked Ryu to a 3-0 lead before he even took the mound, thanks to Corey Seager’s RBI single and Yasmani Grandal’s two-run home run in the top of the first off starter Taijuan Walker. Ryu gave back a run right away in the bottom first, when he allowed back-to-back two-out doubles to Paul Goldschmidt and A.J. Pollock. The left-hander struggled mightily in the third inning and was lucky to give up just one run after three walks and a three-bagger. Ketel Marte lined a triple over the head of center fielder Joc Pederson with one out in that inning. Ryu walked Goldschmidt to put the runners at the corners, but struck out Pollock on a high fastball. Ryu worked the count to full against Chris Owings before walking him to load the bases. Then Ryu walked Jake Lamb on four pitches, as the Diamondbacks cut the deficit to 3-2. Ryu escaped further damage as Nick Ahmed flied out to left, but he wasn’t so lucky in the fourth inning. After getting two outs in the inning, Ryu gave up a single to David Peralta, and Marte brought him home for the tying run with his second triple of the game, this time a scorching line drive to left-center gap. That was the end of the day for Ryu, who allowed five walks and was touched for four extra-base hits. He threw 75 pitches, and 40 of them for strikes. The Dodgers ended up using eight pitchers after Ryu, as their closer Kenley Jansen was unable to preserve the 6-3 lead in the bottom of the ninth inning. One out away from notching the save, Jansen served up a game-tying three-run home run to Chris Owings. The teams traded zeroes until the Dodgers scored the go-ahead run in the top of the 15th on Chase Utley’s single. But the Diamondbacks tied the score at 7-7 thanks to Ahmed’s double. Two batters later, Jeff Mathis finished the five-hour, 46-minute game with a single off Wilmer Font. Ryu, 31, is in the final year of his six-year, US$36 million contract. He is the Dodgers’ fifth starter this year behind Clayton Kershaw, Alex Wood, Kenta Maeda and Rich Hill. Ryu made two starts against the D-Backs last year, and had a 0-1 record with a 6.30 ERA in 10 innings. He struck out nine, but also gave up three homers and eight walks over those 10 innings.